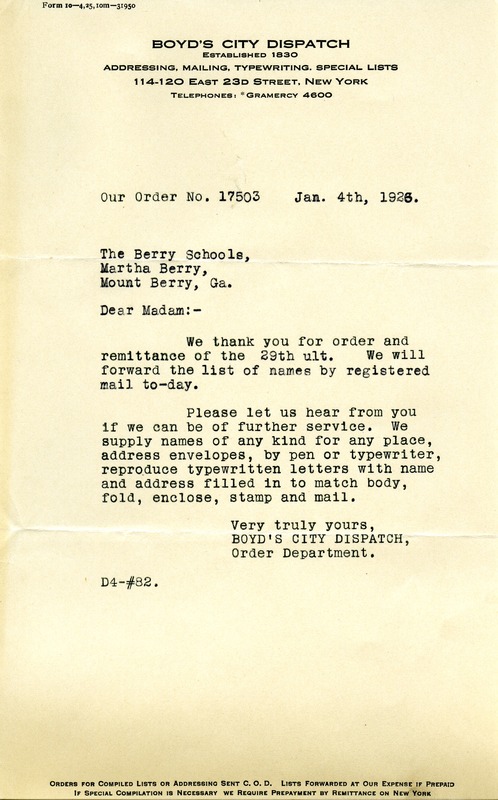 Boyd's City Dispatch writes to thank Miss Berry for her order and payment for the list of names. The services of Boyd's City Dispatch are also listed in the letter if Miss Berry needs further assistance. Boyd's City Dispatch, Order Department, “Letter to Martha Berry from Boyd's City Dispatch.” Martha Berry Digital Archive. Eds. Schlitz, Stephanie A., Chelsea Risley, et al. Mount Berry: Berry College, 2011. accessed April 19, 2019, https://mbda.berry.edu/items/show/1214.